The Storm 360GT Searchbait Swimmer Jig Head is a jig head designed like no other. 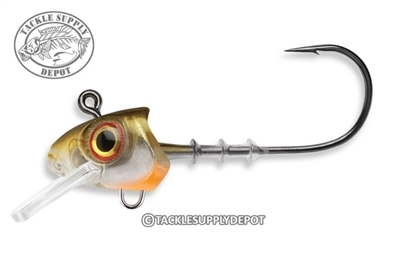 Featuring a crankbait bill design this new jig head allows anglers to add a new level of action and attraction to their swimbait and creature bait fishing. While this jig head pairs perfectly with the Storm 360GT Searchbait bodies an array of swimbaits can be used and a new look can be given to the fish for tournament winning results. Match the jig head to the body length intended for use for the ultimate package.